Getting Ready for Grad School… Part 2: Housing. Alright. So I have to get this application written and sent by tomorrow, and I can’t seem to concentrate. Anywho, I’m hoping that writing another blog post will make me feel like doing something productive this evening. So here goes the continued discussion of getting ready for grad school. Well, I think I made a huge error when I thought that I could look for housing around August or something. I hadn’t received my acceptance letter until mid-summer, and I assumed that I should be applying for housing when I get the letter. I naively assumed that, since I didn’t have any problem getting in to a residence at or housing near the University of Waterloo (UW), all universities must be equipped with enough residences on campus and nearby off-campus sites to accommodate all students. Turns out that getting into a residence at UBC is a lot more competitive than UW. I think the waiting list usually grows well above a couple of hundred. Since the housing applications are processed in first-come-first-serve basis, it’s wise for you to apply as soon as you can. And that means you should be hitting that ‘apply’ button now, if you haven’t already done so yet and plan to live on campus. Some tricky housing contract rules apply at UBC as well. Once you get in, you need to make sure you read the contract before you sign it. While places like the Thunderbird Residences allow you to give them a month or so of notice before you move out (should you happen to do so), that doesn’t really work for Marine Drive Residences. When you sign up to live at Marine Drive, you are signing up to live at the residence until August 15th of the following year, unless you renew your contract or notify them of your intention to move in April. Otherwise, you’ll need to pay fines and will not be able to get back hundreds of dollars of deposit you need to give them before you move in. Tricky as it may sound, living in residences can have its benefits. Most residences feature a small gym, a music room, and a commons block where people can meet/hang out. If you are new to Vancouver, chances are you’d like to meet new people and make new friends. Residences can help you with that. But then again, your idea of grad school may involve throwing away your lifestyle from residence-bound undergrad life. If that’s the case, you can get into studio or one bedroom units on campus (technically also residences) or go off campus. The only trouble is that independence always comes at a price. If you have a significant other, or someone you don’t mind sharing a one-bedroom with, then living on campus can be quite affordable for you. Get into a one-bedroom Thunderbird Residence unit, and you’ll likely pay a bit more than $500 per person per month. 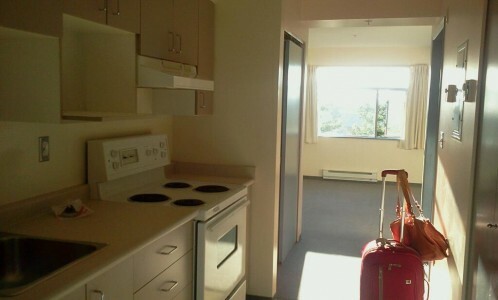 But if you’re an independent (but not in a lonely way) person who values alone-time quite a lot, the cheapest studio unit on campus, I think, is about $850 per month. If you add up the $350 difference over 12 months, that’s quite a lot of money. Prices for places off campus are quite similar I think. If you are looking for a studio or a one-bedroom unit on craigslist, you’re likely to come across a basement unit at someone’s house from $800/month and up. Of course, anything off campus requires you to either bike or bus to campus. And if you consider the geographical location of UBC, you’ll notice that you need to go through a large patch of green land (the Pacific Park or the University Endowment Lands) before coming across the first set of traffic lights on campus. I’ve made a little area map to give you an idea of this. Some creative affordable solution to the housing problem includes living on a boat, living far away but cheap and not coming in to the lab everyday, and house sitting and pet sitting long-term for someone in exchange for not paying rent. Mind you, these creative solutions are not imagined by me, but I pull them from what former UBC students have done. 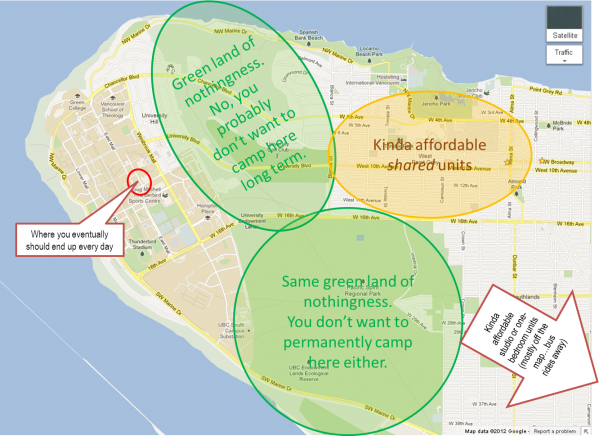 Now, that is not to say that you’re stuck with terrible housing options. One of the ‘thank god’ moments you’ll realize when you get here is that transit in Vancouver is really not that bad. And UBC happens to be the last stop for quite a number of buses, including three different buses that come from downtown (#44 – express, #14, and #4), two express buses (#99 and #84) that connects you to anywhere East of campus along Broadway or 4th Ave, and a few buses that take you East also, but along 33rd and 25th ave #33 and #25). So, getting to an off-campus home could be a couple of express bus stops away, which is really not that bad. Well, that’s it for my babbling about the housing situation at UBC. I guess the most important thing is to think about what’s most important to you. 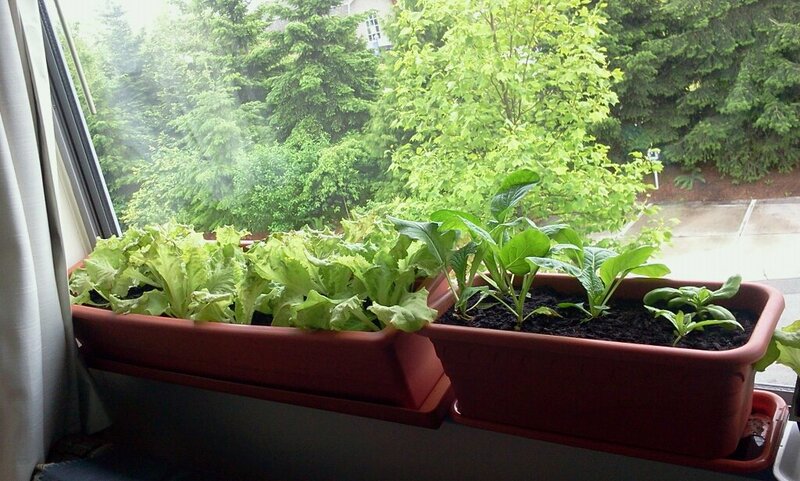 Now that I am really into gardening, I’ve decorated all of my windowsill with my plants. And I am so glad that I’m living in an upper level studio unit with lots of window space. I would not want it any other way — at least for the summer anyway. 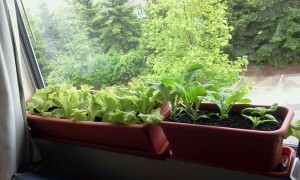 Apparently my lettuce plants wither quickly when it’s too hot and not watered twice a day. So I tend to go home for lunch (only two minute walk from my lab) and water them — and how could I do that if I was living off campus? 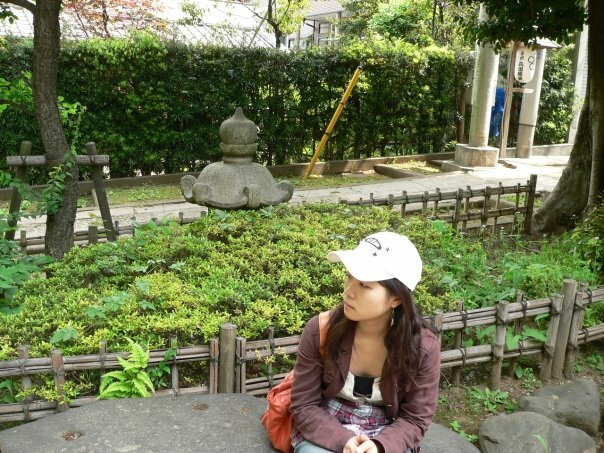 This entry was posted in Surviving Grad School and tagged Housing, Prep for grad school on June 19, 2012 by AJung. 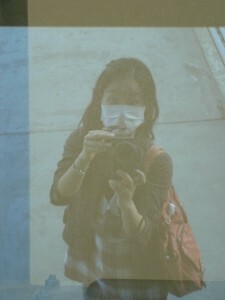 AJung in 2009 taking a ferry from Osaka, Japan to Busan, Korea, before moving to Vancouver for grad school.. This was when SARS was the big no-no, and everyone in Japan were asked to wear masks, including on the ferry. Later in May I convocated, along with my labmate Tom and fellow Mechanical Engineering students. It was somewhat of a weird experience since, as you may know already, I am not going anywhere. The day I finished my MASc., I started my PhD. So convocation itself didn’t feel like the dramatic end of a long journey and start of a new life that so many valedictorians tend to emphasize. To be perfectly honest with you, taking a vacation in Miami after my thesis defence was more dramatic than the convocation. But that doesn’t mean I didn’t enjoy the convocation. The weather was perfectly sunny that day, so the pictures turned out nicely I think – although my sister is holding onto the pictures still… And if there’s one thing that I look forward to during UBC convocation is the cake they give out for you and your guests for free… yum…!! Anyways, dramatic or not, convocation definitely is one of those things that puts a period at the end of your sentence. Even if you don’t attend, the fact that you receive your degree after that day just kind of puts the proper closure to things like getting your MASc or PhD. About three years ago, I had just graduated from the University of Waterloo with an Honours Mechatronics Engineering program. And, with my passion for roboethics and human-robot interaction, I ambitiously went to a robotics conference in Japan and toured around Korea. That was how I spent my last summer before starting grad school. That trip also led me to take on a part time job in Seoul, completely forget my birthday (seriously, I don’t even know how I managed to do that), and empty out most of the money I had saved up from my previous co-op terms. But it was definitely worth while. It gave me a good exposure to the field of robotics, and roboethics. Some of the people I met at the conference are now my collaborators /mentors /friends within the field of robotics. More importantly, I got to spend some time with my family and my relatives. I still remember flying out to Vancouver with my sister in August of 2009. My sister had flown with me to help me settle down and to spend the last few days of my freedom with me. I remember feeling quite anxious about my new life as a graduate student. I was thankful that I got into the program I had so wanted to get into. At the same time, everything seemed so uncertain — including what kinds of lab mates would I be working with, what courses I should be taking, whether to address my supervisors by their first names etc. So in the next few posts, I think I will think back to those early days and share what I did during the last summer before grad school. Hopefully this will be helpful for some of you? If not, no worries. I’ll still be blabbering about these things eventually anyway. Haha… But for those of you who are prospective UBC grad students, please do feel free to ask me specific questions. I’ll try my best to write relevant/helpful posts for you. 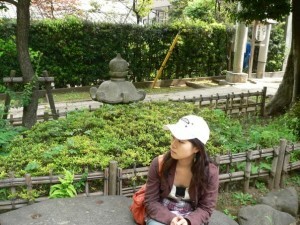 This entry was posted in Surviving Grad School and tagged Prep for grad school, Travel on June 13, 2012 by AJung.